An Electrical Apprentice is a person who takes the first step as an apprentice towards becoming a fully licensed and capable Electrician. 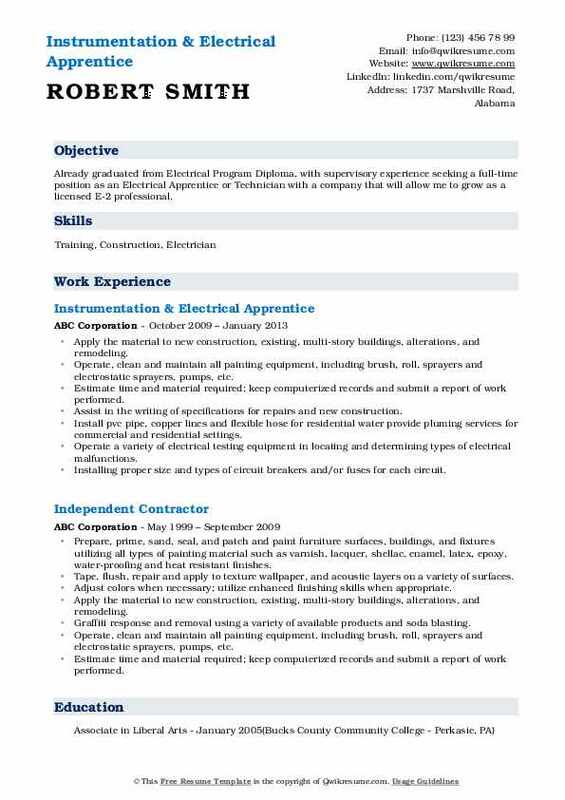 A well-drafted Electrical Apprentice Resume gives a list of the following duties and tasks – assisting in installation and maintenance tasks, ensuring efficiency in operation of various electrical equipment, handling electrical tasks that require less skill or no experience, testing malfunctioning equipment, identifying defects, repairing equipment, replacing defective parts; aligning adjustments, understanding blueprints and equipment specifications; and adhering to local and federal regulations and safety requirements. 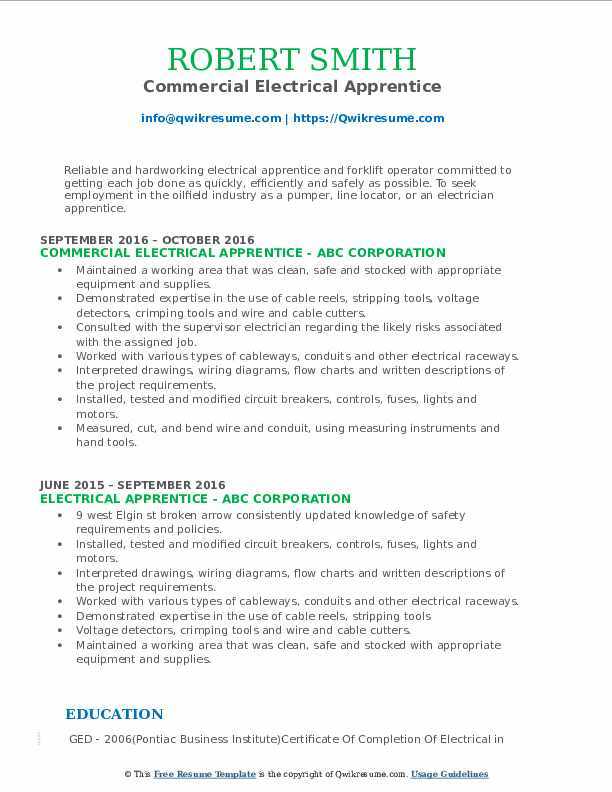 Employers look for Apprentice with the following skills – demonstrable knowledge of electrical codes; ability to understand schematics and technical manuals; strong troubleshooting abilities, willingness to learn new things and troubleshooting skills. 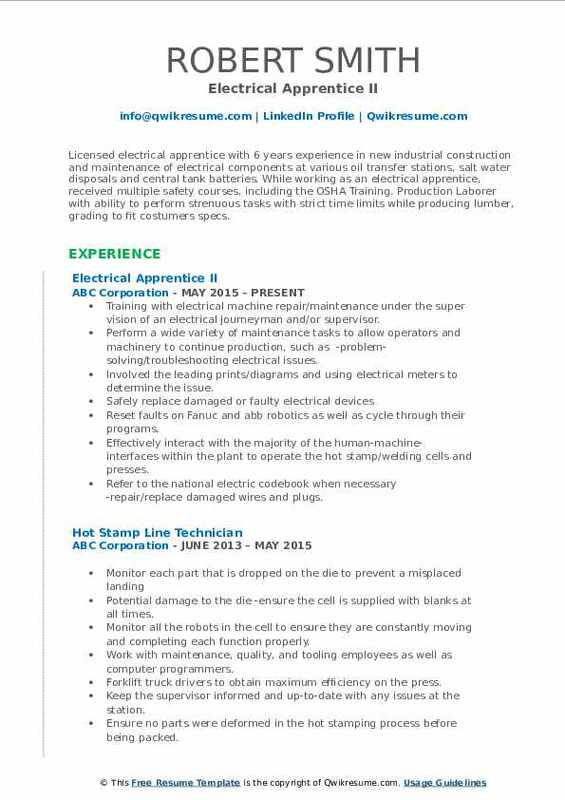 To start as an apprentice, candidates should be above 18 years of age and have a high school diploma or GED. Headline : Responsible Electrician proficient in Bending/running conduit and installing a variety of devices. Passionate and motivated, with a drive for excellence. 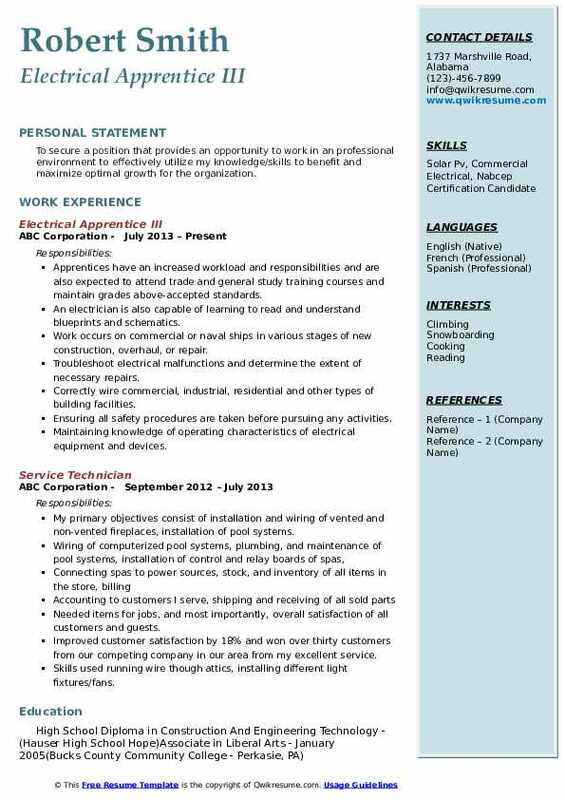 7 years in commercial and industrial positions. Also decent forklift experience.. Measured, cut, and bend wire and conduit, using measuring instruments and hand tools. Transport tools, materials, equipment, and supplies to work site by hand, hand truck, or heavy, motorized truck. Objective : Extremely self-motivated with strong work ethic, who is comfortable working independently, as well as in a team environment. Strong time management skills with clear understanding of schedule and budget requirements. New construction and remodeling, setting service, panel, home runs, circuits, lights, hot tubs, security, garages, kitchens, rooms, smoke alarms, low voltage, everything electrical. Accurately measured proper wire lengths in order to reduce supply waste. Utilized hand tools and special equipment to connect couplings, thread conduits end, and to secure conduit support brackets. Worked jointly with lead electrician in connecting power cables, and installation of ground leads into various equipment. Install a variety of extra pumps such as sewage pumps, drainage pumps and garbage disposals. Implement water lines and drainage for showers, tubs, faucets, water heaters, refrigerator ice and dishwashers. Build and replace sinks, faucets and surrounding countertops and baseboards. 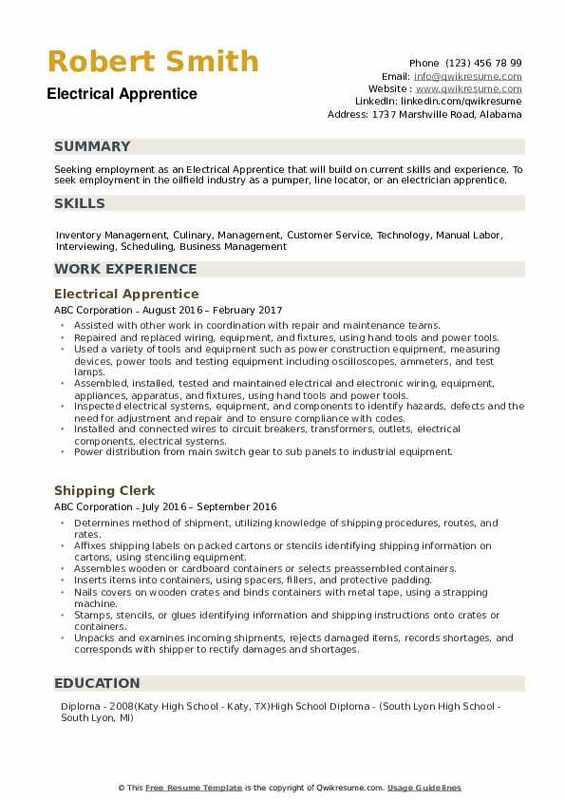 Objective : To obtain a position as Help Desk Technician, that will allow me to utilize and enhance my skills.An interesting position with a growing company. Motivated individual seeking to open and expand upon the skills learned. Operate all equipment including trenchers, backhoe, and lift trucks in a safe manner. Comprehend and practice safe work procedures as outlined in Walker engineering safety policy handbook, has-com policy, and lockout/tagout policy. Operate two-handed tools/equipment, cable cutters, hammer drills, compression tools, and jackhammers. Read and interpret maps, instructional manuals, worksite directions, and written instructions. Operate and work from mechanical personnel lifts, both electric and gasoline powered. 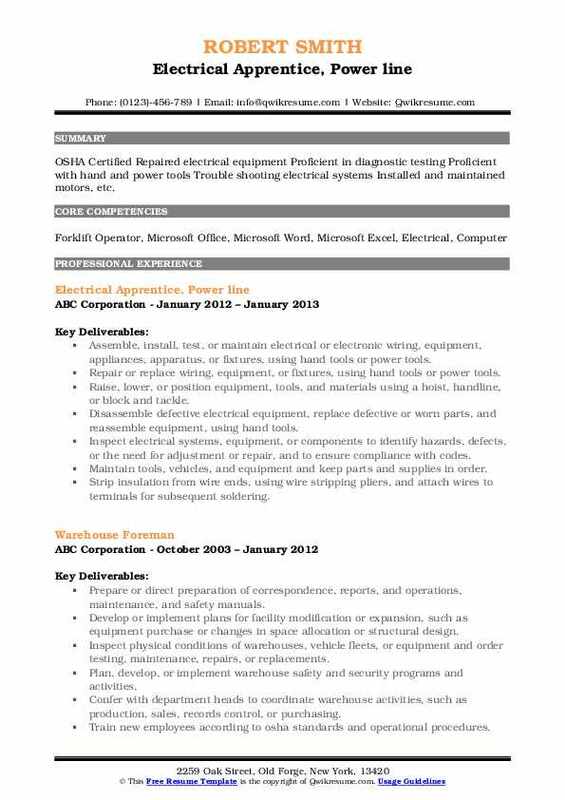 Work energized circuits and equipment with company management approval as outlined in Walker engineering safety policy. Install and make branch wire terminations in junction boxes and panel boards. Troubleshot electrical control circuits using digital multi-meters and other electrical tools. 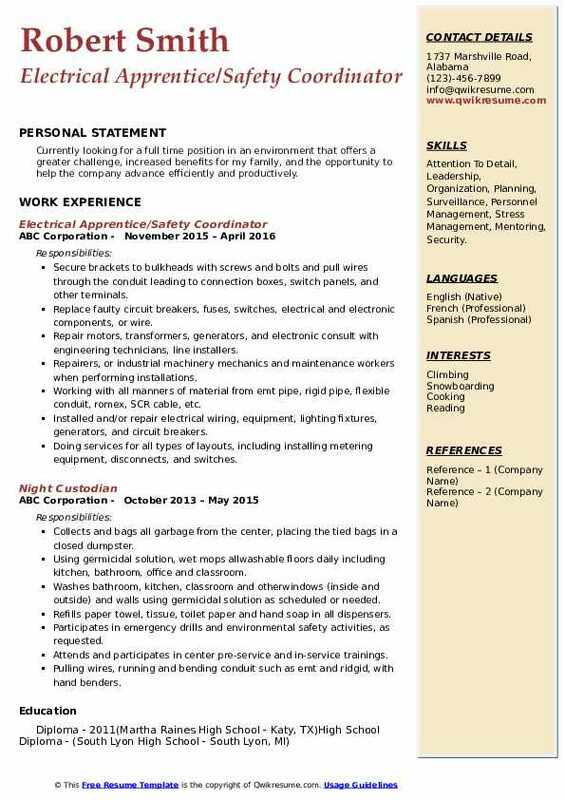 Headline : Licensed electrical apprentice with 6 years experience in new industrial construction and maintenance of electrical components at various oil transfer stations, salt water disposals and central tank batteries. While working as an electrical apprentice, received multiple safety courses, including the OSHA Training. Production Laborer with ability to perform strenuous tasks with strict time limits while producing lumber, grading to fit costumers specs. Training with electrical machine repair/maintenance under the super vision of an electrical journeyman and/or supervisor. Perform a wide variety of maintenance tasks to allow operators and machinery to continue production, such as -problem-solving/troubleshooting electrical issues. Involved the leading prints/diagrams and using electrical meters to determine the issue. Reset faults on Fanuc and abb robotics as well as cycle through their programs. Effectively interact with the majority of the human-machine-interfaces within the plant to operate the hot stamp/welding cells and presses. Refer to the national electric codebook when necessary -repair/replace damaged wires and plugs. Walking Fanuc and abb robots through the new job's program to ensure proper functionality and adjust set positions if necessary. Headline : To secure a position that provides an opportunity to work in an professional environment to effectively utilize my knowledge/skills to benefit and maximize optimal growth for the organization. Apprentices have an increased workload and responsibilities and are also expected to attend trade and general study training courses and maintain grades above-accepted standards. An electrician is also capable of learning to read and understand blueprints and schematics. Work occurs on commercial or naval ships in various stages of new construction, overhaul, or repair. Troubleshoot electrical malfunctions and determine the extent of necessary repairs. Correctly wire commercial, industrial, residential and other types of building facilities. Ensuring all safety procedures are taken before pursuing any activities. Maintaining knowledge of operating characteristics of electrical equipment and devices. 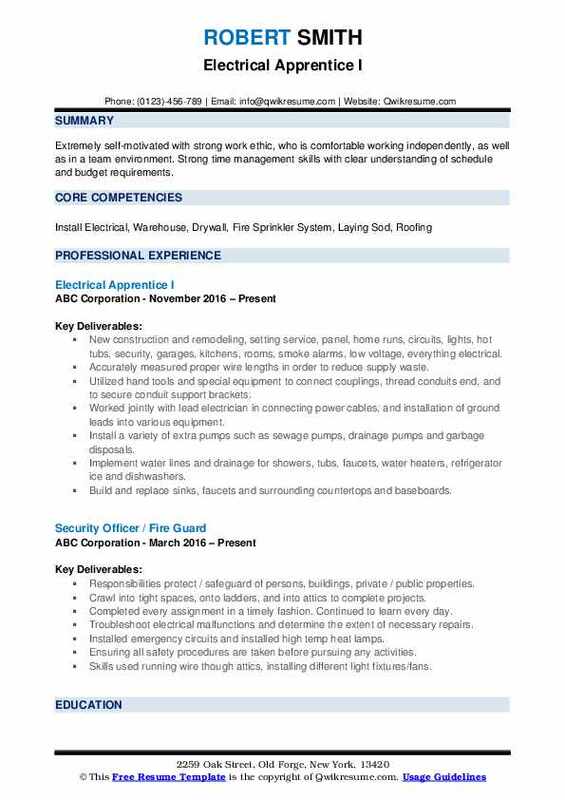 Summary : Already graduated from Electrical Program Diploma, with supervisory experience seeking a full-time position as an Electrical Apprentice or Technician with a company that will allow me to grow as a licensed E-2 professional. Apply the material to new construction, existing, multi-story buildings, alterations, and remodeling. Operate, clean and maintain all painting equipment, including brush, roll, sprayers and electrostatic sprayers, pumps, etc. Estimate time and material required; keep computerized records and submit a report of work performed. Assist in the writing of specifications for repairs and new construction. Install pvc pipe, copper lines and flexible hose for residential water provide pluming services for commercial and residential settings. Installing proper size and types of circuit breakers and/or fuses for each circuit. Checking out system faults and making repairs under supervision of a journey person. 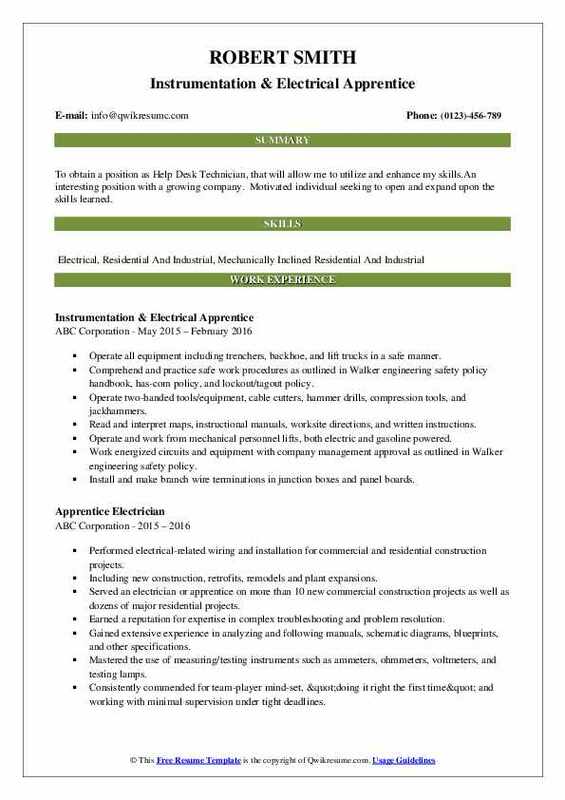 Objective : Reliable and hardworking electrical apprentice and forklift operator committed to getting each job done as quickly, efficiently and safely as possible. To seek employment in the oilfield industry as a pumper, line locator, or an electrician apprentice. Placed pancake boxes, recess cans, safety plates, put staples on romex, put wire inside of outlet boxes, and do makeup. Summary : OSHA Certified Repaired electrical equipment Proficient in diagnostic testing Proficient with hand and power tools Trouble shooting electrical systems Installed and maintained motors, etc. Raise, lower, or position equipment, tools, and materials using a hoist, handline, or block and tackle. Objective : Currently looking for a full time position in an environment that offers a greater challenge, increased benefits for my family, and the opportunity to help the company advance efficiently and productively. Skills : Attention To Detail, Leadership, Organization, Planning, Surveillance, Personnel Management, Stress Management, Mentoring, Security. Secure brackets to bulkheads with screws and bolts and pull wires through the conduit leading to connection boxes, switch panels, and other terminals. Replace faulty circuit breakers, fuses, switches, electrical and electronic components, or wire. Repair motors, transformers, generators, and electronic consult with engineering technicians, line installers. Repairers, or industrial machinery mechanics and maintenance workers when performing installations. Working with all manners of material from emt pipe, rigid pipe, flexible conduit, romex, SCR cable, etc. Installed and/or repair electrical wiring, equipment, lighting fixtures, generators, and circuit breakers. Doing services for all types of layouts, including installing metering equipment, disconnects, and switches. Worked with low voltage systems that involved automation, audio-video, telecommunication, and lighting controls set up and tested industrial equipment. 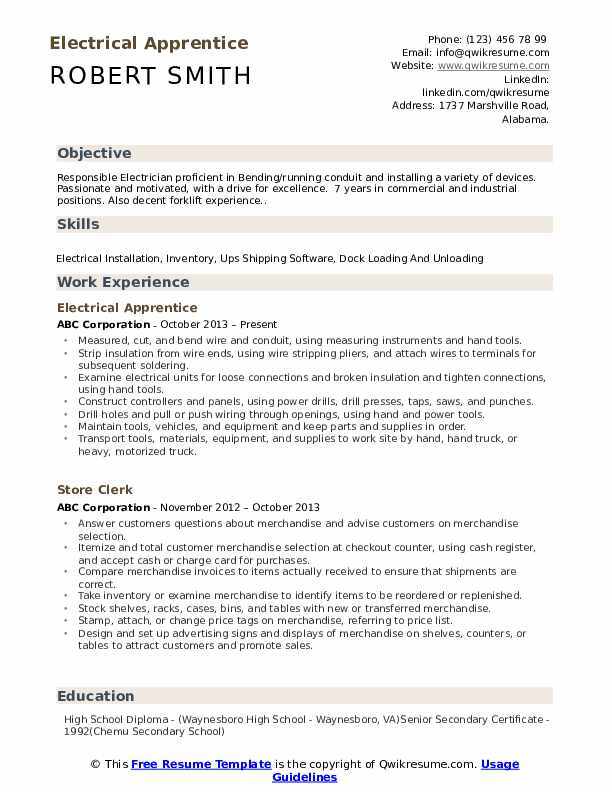 Objective : Seeking employment as an Electrical Apprentice that will build on current skills and experience. To seek employment in the oilfield industry as a pumper, line locator, or an electrician apprentice. Assisted with other work in coordination with repair and maintenance teams. Repaired and replaced wiring, equipment, and fixtures, using hand tools and power tools. Used a variety of tools and equipment such as power construction equipment, measuring devices, power tools and testing equipment including oscilloscopes, ammeters, and test lamps. Assembled, installed, tested and maintained electrical and electronic wiring, equipment, appliances, apparatus, and fixtures, using hand tools and power tools. Inspected electrical systems, equipment, and components to identify hazards, defects and the need for adjustment and repair and to ensure compliance with codes. Installed and connected wires to circuit breakers, transformers, outlets, electrical components, electrical systems. Power distribution from main switch gear to sub panels to industrial equipment.